Talking about eventually making friends, may I ad: The legendary Leif Ericson lead Vikings to Canada (long before Columbus!) and the east coast of what 500 years later became the United States. My regularly readers know I’m even married to one! 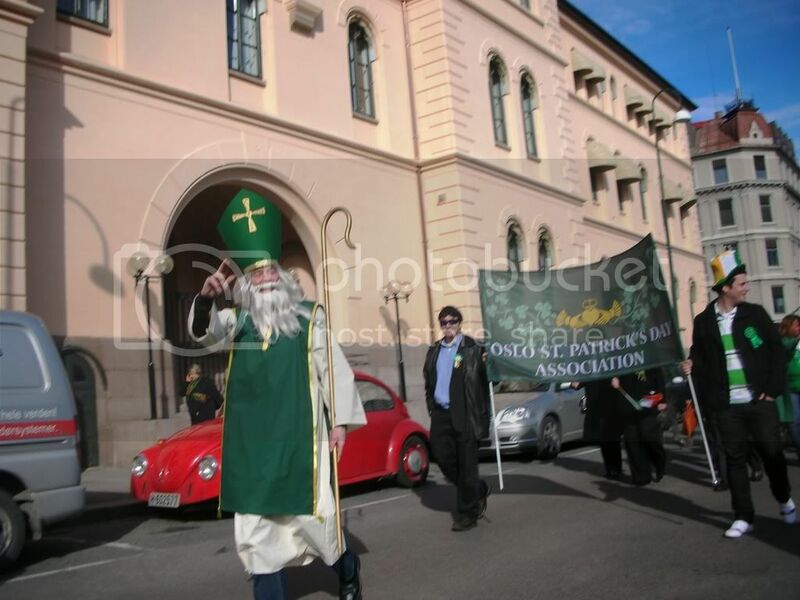 Its organised by Oslo St. Patrick’s Day Association. From its start the parade has continued to grow in size and now includes a pipe band, musicians and dancers, leprechauns and other strange creatures, wolfhounds and the venerable St. Paddy himself. As well as locally based Irish, Norwegian friends of Ireland, and friends of every nationality, many visitors from Ireland and elsewhere making their way to Norway to enjoy the parade. If you would like to hear how great the Bag Pipe Band sounded, click here and turn up your speaker! All the pics can also be seen at my Flickr account. There must be many of you who have made a St. Patrick’s post these days. Leave the link in a comment and I’ll update this post! #4: Olga, The Traveling Bra A Globe-trotter: Olga Go Bra! #5: EastCoastLife in Singapore: St Patrick’s Day Parade in Singapore – Weekend Snapshot 15. #8: Expat Travels, From Switzerland to Canada: Happy Saint Patrick’s Day. #9: Fleur de Lisa, From Indiana, US: Happy St. Patrick’s Day!. #10: Here in the Hills -Naomi: OldOldLadyOfTheHills in LA, US: a st.patricks day wish. #11: Eric “Speedcat Hollydale” in Minnesota, US: Saint Patty Cakes & Greenbriar HollyCat. #12: Simply Sofie, A Filipino in Swiss: Our summer vacation in Ireland. #13: A little piece of me, Claire from Cheshire in UK: Today I will mostly be…. It was great fun my dear!! Thanks for sharing it with me. The video is great too!!! May you have a strong roof over your head. It was and sharing it with you, doubles the fun! I read today’s paper that we did have a patrick here yesterday too and I can’t imagine the ‘magnitude’ Renny…very very interesting and the stew … drooling again. Hey, thank you for the birthday wishes ya! Yea, I know it’s celebrated almost all over the world. Glad you liked Diane’s stew too. Your welcome – thanks for sharing your celebration ya! I’m of Scots/Irish descent, but there’s not a big population of Irishmen in this area so no parades or parties here. It was fun to see your pictures and the stew looks good! I like corned beef but never thought to get any to cook for St. Paddy’s Day. Thanks for telling – interesting to know Diane and now you know my wife is so too. Glad you liked the dinner too! Wishing you the same and a bunch of hugs back to you. Well, I’m just going to wear green. The only thing that we do here is go to an Irish pub. And I’m aware that Pennsylvania has a huge population of Irish-Americans. You mean green all over – sounds great! Like others have comment, there is a lot of St. Patrick celebration in American as there are so many Irish. You find the same about Norwegian, especially in the mid west. ah what a fun post. i knew some about the Norwegian conquest of Ireland but i never knew the irish invaded you all recently. i’ve got a silly post up with some quizzes for the day but that’s it. I liked your post and have updated this post with your link already! Nice background info and matching pictures! Wishing you the same – thanks for the compliments Sidney! Found your excellent blog via google..I was searching for St.Patricks Day pics from Oslo ( I spent a while living in Norway a few years ago and was wondering if the parade was still going in Oslo) – and yours came up tops on Google. It looks like there was a great turn out. Anyway. Just a quick note to say hi and thanks for uploading the pics. If you’re popping down to the Dubliners tonight for a pint of the black stuff, make sure you say hello from me to Oslo’s very own ‘St. Patrick’ (aka Seán Dunne)! So you’ve seen the parade with your own eyes earlier then – how great – hope it still looks familiar! Sorry, I didn’t go to the Dubliners in Oslo tonight, but I’ll tell him if I go there for sure! Happy St. Patrick’s Day! The Irish Stew looks wonderful! All I would add is a little boiled cabbage! Yum! Sorry I haven’t been around the last few days. I was off to visit my parents and sister in Connecticut! Thanks! I do agree, since Irish, cabbage is very much in use – as in Norway like in Lamb in cabbage. You don’t need to apologise – your are one of my most trustful visitor – hope you had a great visit! I’m amazed how much you celebrate St. Paddy’s day in Oslo! Here in France, it seemed to be a big deal a few years back, but this year I haven’t seen anything about it. I think much depend on if it falls on a drinking-friendly night — basically from Thursday to Sunday. This year it was not the case. Of course, I’m sure you know that the place where St. Patrick’s Day is celebrated the most is the USA! This was my first time, so I was a bit surprised too. I think you are right about the right day of the week. This parade was on Saturday, even if the original day is today, Monday the 17th. I know and it’s a bit like Norway and Norwegians: there are actually more of them in North American than in Norway. That meal, especially the beer (ha! ), looks good! Thanks for keeping me posted – I’ve updated my post of course! PS: Russia and/or Norway sounds GREAT! I’ve got pretty a full itinerary thru’ May/June…but will keep you abreast of my plans! I’d really enjoy hanging out with you somewhere/someday RennyBA! It would be an even more spicy adventure if you could participate – so come on over next year! I’ve updated my post with yours of course! Hanging out with me – in Norway – sounds terrific – I’m ready when you are Olga, so keep me posted! It just goes to show, everybody’s Irish on St. Patrick’s Day! And, since you asked, I’ve been posting about the holiday all day, so instead of giving you seven or so links (not counting the post I’m about to do about your excellent parade coverage), I’ll just say you can find it at the usual place, brykMantra.com! Yea, and for a lot of reasons in Norway you know! I’ve read all your 7 posts – great – thanks for tagging me on one of them – my post is updated with a link to yours of course! Thanks for the compliments – wish you a great one too! Hi Traveller – good to see you – always nice to welcome new readers! A nice run-up of history. Great St Pat celebration. Glad you find it interesting too Fruity! I manage to celebrate St. Patrick’s day when I was in Norway with some of my friends from Canada. We went to this Irish pub and drank alot! I have totally forgotten it’s St. Paddy’s day. I had every one wear red while we went to six flags amusement park. You have the best St. Pat’s Day post I have seen so far. Of course being a Norway descendant living in Minnesota – I love the Vikings … AND the Vikings. The parade in Oslo was more fun and colourful! 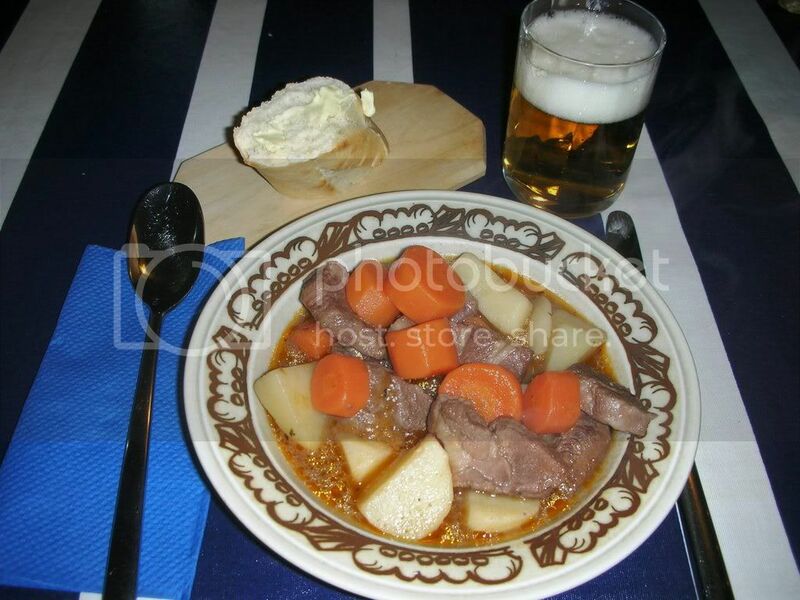 … and you get to eat Irish stew! St Patrick’s Day isn’t celebrated by Singaporeans but by the expats who work and live there. Glad you liked the Parade and I do liked your post from Singapore too – your welcome – hope others hops over and read yours too! So, you’re celebrating St. Patrick’s Day in Norway! That’s nice. Well, I was able to visit the St. Patrick’s Cathedral in Ireland last year. And I also ate the traditional Irish stew but I should have eaten what hub ate, braised lamb shank. I even posted a picture of it. :) Here’s the link, hope it’s ok, although it’s not about St. Patrick’s Day. We do and glad to share it with you too! Thanks for your link to a lovely post about St. Patrick’s – its on the list of course! Wish you and your family a good one too Sofie! I was reading it last year, yea, but good to be reminded! What fun you must have had! That Irish Stew looks delicious, you must post the recipe! We were supposed to have a big St. Patrick’s Day parade in Atlanta but they had to cancel due to the tornadoes. Savannah, GA also does a very big celebration, even turning the river green! Hi Tanya – always great to welcome new readers and thanks for the add at BlogCatalog. Sorry you’re parade was postponed, but thanks for telling anyway – to enriches the theme and reports of this post I mean. Wishing you a good one too! It is wonderful to see how St. Patricks Day is celebrated, halfway round the world in your Beautiful country….! And that dinner that your lovely wife made looks SOOOOOO Delicious! Thanks for linking me, Renny…..
We had a 10 hour Power Outage up here—-all day yesterday….So, this is my first chance to come on by….! Yea, isn’t it and I’m glad I could host the report gatherings – of course you should be on on the list! Glad you liked Diane’s stew too! Your welcome and thanks for your link with reports about your St. Patrick’s day celebration – great picture – hope everyone pop over to see! Thanks for your compliments Tor – hope we co join together next year – and a couple of beers afterwards! Good to have you in our vacation house in Sweden this Easter Break too! Thank you so much for having dropped by my blog :D! It is indeed great to see you on Big Bang :)! Your wife is Irish descendant? That is extremely interesting! belated Happy St. Patrick’s Day for both of you :D! I loved the photos on this post; so green and cheerful! Hei Max – always great to see new visitors! Thanks for participating on Big Bang too :)! Well, a lot of Americans is Irish descendant, aren’t they. Glad you liked the pics and cheers to you too! looks like a lot of fun. There wasn’t any sun for us here and nearly rain. I chose not to make the long trek to see the party.. Looks so easily accessible for you! What great photos and report! We had fun – sorry you did not make it – hope you can contribute with a post next year then! Diane’s Irish stew looks divine! I think your parade looks wonderful. I missed parade this year– working. Diane is a great chef you know! Glad you liked the parade in Oslo and hope you’ll make to see yours next year! This looks like a fun day – for a start, you had much better weather than we had in London this year. I never knew the Norwegians and Irish were so closely associated. Very interesting. Thanks for posting. Now, Irish stew I love! Not a piece of fish or anything from the sea in it! You can have that when I come to visit! After reading your post, I red the Saint Patrick’s day on wikipedia! Nice to learn always more blogging by you! Although I was born in Dublin and we always returned there for holidays from Africa, I didn’t do a St Patrick’s Day post. I fear it is becoming Disneyfied these days. We did have Irish stew, though I can’t make it as well as my grandmother did. She always used meat on the bone. Even when we were in Africa, my grandmother would try to mark the day by sending some shamrock. Sometimes it arrived!! Thanks so much for posting the pictures (and the brief history lesson). Once again, I missed the parade in Oslo so I’m hoping for fifth time lucky in 2009! Seems like the weather was great. Very interesting info about the history of Ireland and Norway. Maybe a little late, but here is a link of the St. Patrick’s Day parade in Boston. 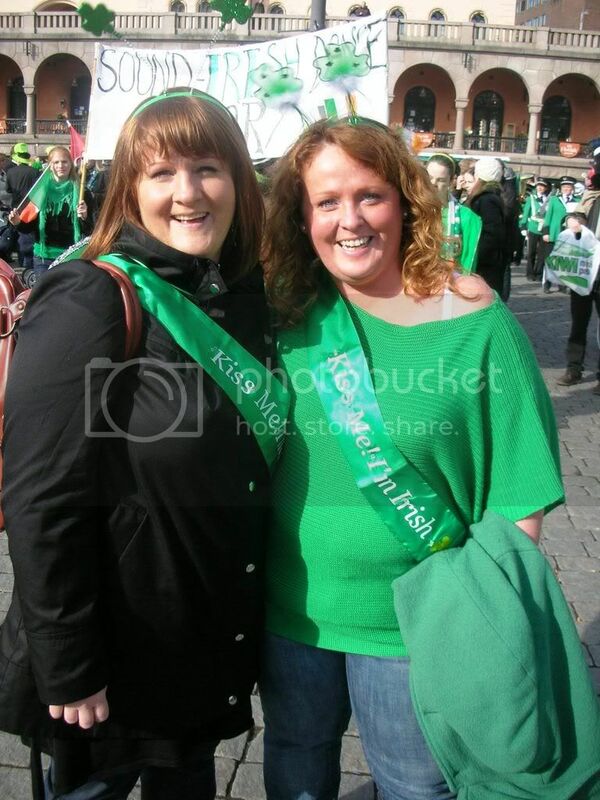 nice pictures and oh no, i missed the St. Patrick´s Day Parade, but next year i´ll coming. For sure! !